Share your passion: Whatever you’re passionate about, it’s on Buycheapsoftware-store. Share your finds with your audience and get paid when items sell. 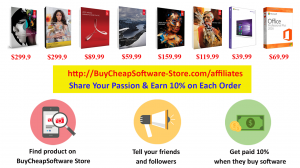 Make money with Buycheapsoftware-store Affiliates: You’ve got an eye for great Buycheapsoftware-store listings. Simply link an item or share your finds through Facebook, Twitter, your blog or website. If what you share sells, you’ll earn money. Earnings add up quickly: Get up to 10% money per each order. Earn advertising fees when Order status is “delivered” ( it means that when a customer placed new order and paid the status order is delivered, if customer not pay for items, the status is pending you don’t earn advertising fees).